When a student came to her office with mental health concerns and asked to withdraw from her classes, Cara Appel-Silbaugh used her position to ease the transition. The student was set on moving back home, so Appel-Silbaugh, the associate dean of students at the Georgia Institute of Technology, called and directed the health center on campus to locate a treatment center near the student’s home that would accept her insurance. Then, she called the registrar’s office to make sure the student would get as much of a refund as possible. “All of those things only took a phone call because of the relationships I had built,” Appel-Silbaugh said. Building relationships like those so she can help students, Appel-Silbaugh said, would be one of her top priorities if Pitt chooses her as the next vice provost and dean of students. Pitt faculty, staff and students interviewed Appel-Silbaugh, the fourth and final candidate for the open dean position, on Friday. A group of about 15 faculty, staff and students — four of whom also serve on the search committee for the dean of students — questioned Appel-Silbaugh for about an hour on her ideas for the dean of students job at Pitt. Focusing on building relationships with individuals, Appel-Silbaugh outlined her plan to make more resources available to students — particularly for international students, members of the LGBTQ+ community and student activists. John Twyning, an associate dean for undergraduate studies and member of the search committee, said the committee would deliberate on the four candidates and make its recommendation to Provost Patricia Beeson and Chancellor Patrick Gallagher on Monday. The dean of students position at Pitt has been open since January last year when Gallagher promoted then-Vice Provost and Dean of Students Kathy Humphrey to senior vice chancellor and chief of staff. Former Associate Dean of Students and Director of Student Life Kenyon Bonner has filled the position in the interim. Bonner is also a candidate for the full position and interviewed on Tuesday. 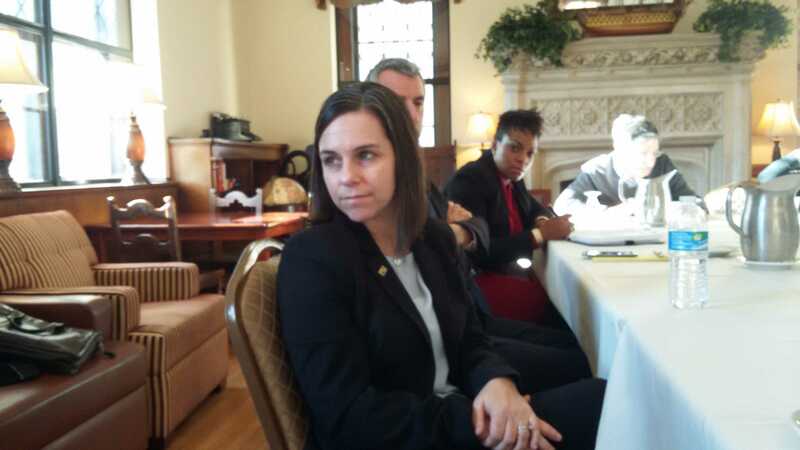 Appel-Silbaugh, a 1996 Pitt graduate, said building relationships with departments and people at Pitt — such as the student health center, the registrar’s office and Pitt’s faculty — is key to the position and would be one of her priorities. Appel-Silbaugh holds a bachelor’s degree in film studies from Pitt, a master’s degree from Bowling Green State University and a doctorate degree from the University of Maryland, College Park. She’s worked as the associate dean of students at Georgia Tech since July 2011. For Appel-Silbaugh, returning to Pittsburgh is both personal and professional. Originally from New Jersey, Appel-Silbaugh said the move would put her closer to family — something she said she wants now that she’s married and has a child. If she gets the job, Appel-Silbaugh said she would prioritize student wellness and would consider building specialized centers for students on campus — including an LGBTQ+ center, a multicultural center and a women’s center — with building relationships with students at the top of her list. But beyond eating with students in Market Central, Appel-Silbaugh said she would focus her attention on individual students. In some cases, a dean of students can act as an adviser to students — something she doesn’t think enough deans realize. For international students, Appel-Silbaugh said she could work to organize a two- or three-day fair that would include banks to get students set up with debit cards, cell phone providers to help the students buy a phone and bus tours so the students can get used to campus and the city. For student activists, Appel-Silbaugh said she would be willing to sit down and talk about their issues face to face and act as their liaison to the upper administration. But Appel-Silbaugh also said she would work closely with faculty and other administrators to ensure students get the most out of Pitt they can. When it comes to students struggling in classes, she said, she will work with the professors, but always protect the students first. Though she declined to say who her favorite candidate was, Robin Kear, a liaison librarian in Hillman Library who attended all four open interviews last week, said all of the candidates stand a good chance. Bonner, she said, has the advantage of already knowing how the job works because he’s held the position in the interim for the last year, and Appel-Silbaugh already knows Pitt well because she is an alumna. She said William Stackman — the associate vice president for student services at the University of Notre Dame who interviewed on Thursday — was impressive because of his depth of experience. Stackman holds a bachelor’s degree, two master’s degrees and a doctorate degree and has worked in student affairs for 30 years. Similarly, Chyongchiou Jeng Lin, an associate professor of health economics who attended all four interviews, wouldn’t say which candidate she favored but said she saw Pitt’s next dean of students among the applicants. For her part, Appel-Silbaugh is hungry for the job.